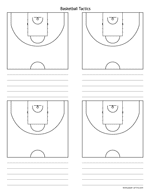 Basketball tactics diagram on an A4 size paper in a vertical, portrait orientation. There are four copies of a court half on each sheet. 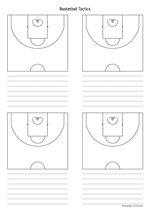 Basketball tactics diagram on a letter size paper in a vertical, portrait orientation. There are four copies of a court half on each sheet.